The Utopia Bowl by Vapor Hookahs is a revolutionary Funnel shaped Hookah Bowl that allows for the Flavored Tobacco juices to stay inside the top of the bowl instead of running down the inside of the bowl, allowing for an extended and enhanced smoking session. 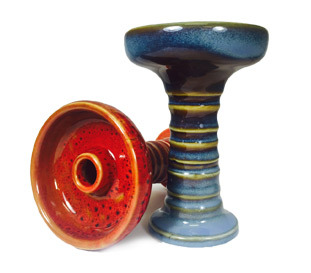 This glossy Utopia Hookah Bowl comes in many unique colors, is very sturdy, and will fit on most Hookah styles in the marketplace. The Utopia Bowl is preferred by Hookah smokers who are looking for a custom looking Hookah Bowl at an affordable price. The Utopia Bowl can hold approximately 35 grams of Flavored Hookah Tobacco. SouthSmoke.com is currently offering a Free Utopia Bowl when you make your next online purchase of $35 or more in merchandise value. To take advantage of this unbeatable offer and bring Home a free Utopia Hookah Bowl, simply add at least $35 of merchandise value to your online shopping cart at SouthSmoke.com. On the main shopping cart page, scroll to the bottom portion to locate the Discount Coupon field. Type FREE UTOPIA BOWL in the Discount Coupon field and click "Apply Discount." Your shopping cart will reflect the Utopia Hookah Bowl Promotion. Complete the online checkout process. For more details regarding the Free Utopia Hookah Bowl Promotion, please click here.